The School District of Marshfield is committed to providing a solid foundation for all students to be successful in a chosen path after graduation. The vision of our graduate is to graduate “College and Career Ready”. All students, beginning in grade 6, will create an Academic and Career Plan (ACP) using Career Cruising. The goal of Academic and Career Planning is to equip students enrolled in the School District of Marshfield and their families with tools to make more informed choices for post-secondary success as it leads to careers. Staff and students will pair academics preparation with career awareness, career exploration, and career planning activities into a student’s educational experience. Marshfield students will graduate ready for future education and the workplace. Students will be strong critical thinkers and be able to collaborate and solve real-world problems. They will be competent both socially and emotionally and persevere when things aren’t quite going right. When put together with academic success, our students will become productive adults with satisfying careers. 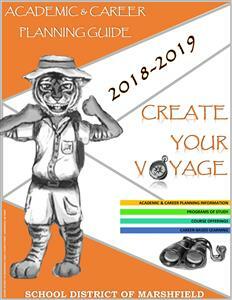 Each student's Academic and Career Plan documents his/her unique personal, academic, social and career goals and the action plans to achieve those goals. Students are not required to declare their career choice nor required to abide by their original goals or plans throughout the process. Parents and students should understand Academic and Career Planning (ACP) is an ongoing process whereas school staff, families, community members, and students use career exploration and activities to learn more about themselves and how their personal strengths and interests connect to future goals. Frequent review and revision of a student's choices and plan is encouraged as part of the ACP process to ensure more thoughtful decision-making.